As you can see Mom's Spring flowers are blooming. She's annoyed because a wood chuck or rabbit ate her Daffodils. Thank you to everyone who asked about me at the Quilt Show last weekend. Mom told me a lot of people were asking where I was and how I'm doing. I'm doing Great! 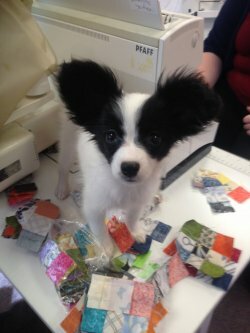 I was helping Grandma run the Shop while Mom was at the Quilt Show. I'd like to extend a big "Welcome" to all of our new newsletter subscribers from the the Quilt Show. I'm Obi Wan the Wonder Dog. I'm in charge of Customer Service and the Newsletter. 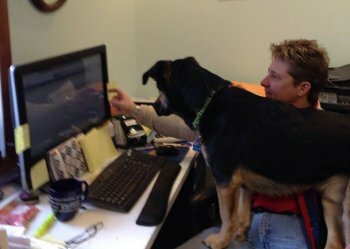 Mom helps me with the newsletter. It's hard for me to hit the keys with my big paws. Grandma's puppy, Moda, has been in the Shop more often now that it's getting warmer outside. She's bigger than this now. I'm teaching her to be a greeter. Now, on to what's happening in the Shop. Mom went down to Janome to the service school for Necchi sewing machines. Our Necchi sewing machines are made by Janome. Now she is a certified Necchi service tech. Mom will work on just about any sewing machine. She still needs lots of practice before working on sergers, though. Mom had decided she's not fond of sergers after working on one at the Necchi school. But we have one someone gave us here at the shop and when she has time, she'll practice conquering sergers. Grandma and Moda stayed with me and my sisters while Mom was at Janome. We all really, really missed her while she was away. We are sooo happy Mom is back home. We loved having Grandma stay with us but we still missed our Mom. Mom will be doing a class on maintaining your sewing machine. I will keep you posted on that. I do know, if you buy a Necchi sewing machine from us, the class will be free. Otherwise there will be a fee. I also know, she will be using a few different sewing machines, old and new. Not just the Necchi machines we have. 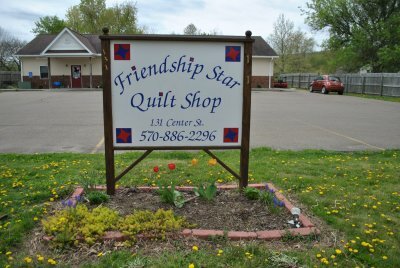 There are a couple of local quilting events coming up in May. 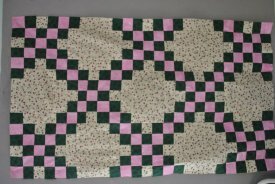 Linda Quinn will be presenting "History Recorded in Quilts"
Saturday, May 6th. Free Pattern and Demo Day. 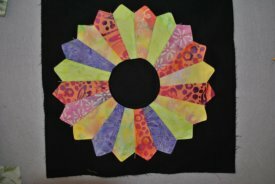 Learn a new technique and get a free pattern. Irish Chain the quick and easy way. I will be on hand to supervise and entertain you during any of these classes. Grandma says I'm very good at this job. I'm sorry there isn't much happening around the Shop this month. Mom and Grandma were so busy trying to get ready for last weekend's quilt show & Mom's trip to Janome, they didn't have time to plan much. If anything comes up, I will keep you informed. Oh, I almost forgot! Mom & Grandma would be annoyed with me if I forgot this. From now and until May 6th. All Yellow, Green and Pink Fabrics are 15% Off. If you received a blue coupon at the quilt show, be sure to come in and use it before it expires! It expires May 15, 2017!!!! Hurry in so you can 15% off one regular priced item! That's all I have for May, folks. Enjoy the beautiful weather but don't forget to come visit Moda and I. We love having people stop by to visit us. If it's too hot or rainy, we have air conditioning to cool you off and colorful fabrics to raise your spirits on a rainy day.